M V Sangaranarayanan obtained his PhD from the Indian Institute of Science Bangalore and was an Alexander von Humboldt Fellow with Prof. Dr. Wolfgang Schmickler subsequently. He is presently employed as a Professor at the Department of Chemistry, Indian Institute of Technology Madras, Chennai. 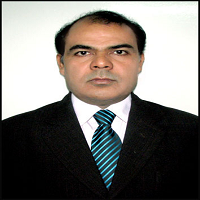 He has published nearly 120 papers in refereed Journals and co-authored two textbooks. His research interests are in electron transfer theories, conducting polymers, electrochemical supercapacitors and biosensors.